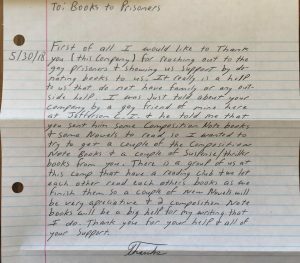 Recently, I came across an amazing organization that spoke to my heart on multiple levels: LGBT Books to Prisoners. 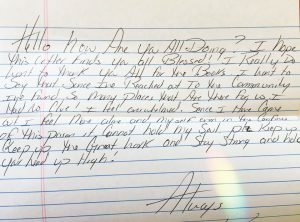 For over ten years, LGBT Books to Prisoners has been working to combat some of the hardships faced by LGBTQ people who are incarcerated. It is a donation-funded, volunteer-run nonprofit located in Madison, Wisconsin, that sends books and other educational materials, free of charge, to incarcerated LGBTQ people across the United States. They have sent books to over 8,000 people in that time. These books educate, entertain, and empower. With these concerns in mind, I knew I had to become involved. I went to the group’s volunteer training, which will forever change my life. The training was held in the basement of the Social Justice Center, alongside a small library of books, organized by genre. We volunteers learned about the program, took a brief tour, and then jumped right in to help. The process goes like this: First, a volunteer takes a letter from a bin that that has been catalogued in a database and screened for what can and can’t be sent to that prison. Prisons have various restrictions and they must be adhered to or shipments of books can be returned or destroyed. Each letter contains a note from an LGBTQ person in prison requesting books. Many also tell a story about the person’s life, though that is voluntary. Most people request an LGBTQ book, and an unlimited number of LGBTQ/queer nonfiction books can be sent, but because of high demand, only a limited number of books in the categories of gay fiction, gay erotica, bi books, and trans books per package can be included. The efforts of the LGBT Books to Prisoners align with the broad goals of NCTE and of NCTE groups and programs such as the CEE Commission on Dismantling the School-to-Prison Pipeline, the Gender and Sexualities Equality Alliance (GSEA), the Cultivating New Voices among Scholars of Color (CNV) Program, the NCTE Black Caucus, and the CEE Commission on Social Justice in Teacher Education Programs. These have all called in various ways for those in our field to disrupt inequities for students of color, for LGBTQIA*+1 people, and for students who are, may become, or were formerly forced unwillingly into the School-to-Prison Pipeline. sj Miller is the Coordinator of the MS Program, Dual Teacher Certification Program in Secondary English Education and English as a Second Language, at the University of Wisconsin-Madison, and is currently writing two books: Gender Identity Justice: Sowing Seeds for Transformation in Education (Teachers College Press) and Navigating Trans*+ and Non-binary Gender Identities (Bloomsbury). sj is editor of the new column “Beyond Binary Gender Identities” for English Journal. Hello how are you all doing? I hope this letter finds you all blessed! I really do want to thank you all for the books. I want to say that since I’ve reached out to the community I’ve found so many places that are there for us. I had no clue! I feel overwhelmed. Since I have come out I feel more alive and myself even in the confines of this prison it cannot hold my soul. Plz keep up keep up the great work and stay strong and hold your head up high! Hay . . . I would like some love story for LGBT inmates they have nothing in our library for us and its not fare. Thank you for your support. I know that it says thank you notes are not necessary but they should be. The work that you do ALWAYS shines a light in this darkness. I can NEVER truly express my appreciation for this. 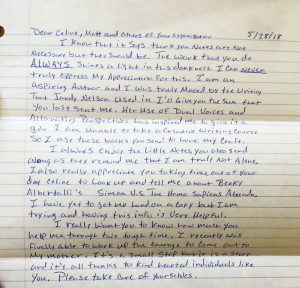 I am an aspiring author and I was truly moved by the writing that Jandy Nelson used in ‘I’ll Give You the Sun’ that you last sent me. Her use of dual voices and alternating perspectives has inspired me to give it a go. I am unable to take a creative writing course so I use these books you send to hone my craft. I always enjoy the little notes you also send along as they remind me that I am truly not alone. I also really appreciate you taking time out of your day Celine to look up and tell me about Becky Albertalli’s ‘Simon vs. the Homo Sapiens Agenda.’ I have yet to get my hands on a copy but I am trying and having this info is very helpful. I really want you to know how much you help me through this tough time. I recently was finally able to work up the courage to come out to my mother. It’s a small step but it is a start and it’s all thanks to kind hearted individuals like you. Please take care of yourselves.